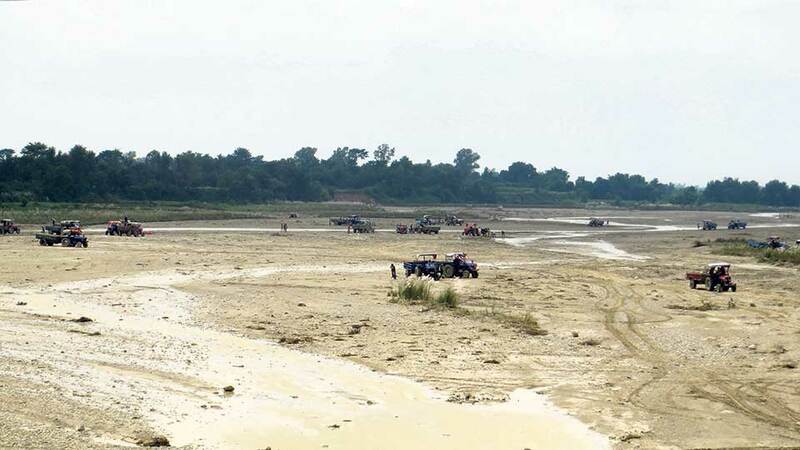 LAHAN, Nov 1: During the last local and provincial elections, one of the promises that almost all political parties and leaders made was prioritizing the conservation of nature and wildlife, especially the Chure range. They stated that the Chure range ecosystem had been badly damaged and vowed to take measures to put an end to activities that were deteriorating the ecosystem further. Deforestation and mining of aggregates, sand and stones from river beds and mountains in the Chure region were put forward as the major factors damaging the range’s ecosystem and politicians had pledged to put an end to such activities. However, locals here feel that the condition has worsened further since the local and provincial governments came into power. They assert that the row between local, provincial and central governments over the rights to control natural resources including the mining of aggregates, sand and stones from rivers and management of forest resources has led to an escalation of such activities. “It is very unfortunate to see the rivers and jungles destroyed in front of our eyes,” said a local of Lahan, requesting anonymity. “Hundreds of trucks carry stones, aggregates and sand from the rivers. Along with that smuggling of the timber continues unabated,” he added. Locals accuse local governments of not showing seriousness in capping such activities. Earlier, when the provincial and local governments had not come into existence, it was the responsibility of the central government to control these activities. Since the implementation of federalism, local bodies have been accorded power to control such activities. However, overlapping of the jurisdiction of local and provincial governments in some cases has led to clash of interests. A clash over the borderline of the natural resources, rivers or jungles between two or more local governments has drawn headlines a number of times. Because of such conflict of jurisdiction, local governments have not been controlling the exploitation of natural resources. Chief administrative officer of Lahan Municipality, Tirtharaj Bhattarai asserts that the rivers and forests need to be protected further but notes that there legal and practical constraints that should be addressed. “We understand that these are serious problems and we are doing our best to control them. However, there are limitations,” he said. “We depend on natural resources to generate revenue while fulfilling needs of the municipality. Along with these practical concerns, we also have legal complications to overcome for taking decisions,” he added. He shared that the municipality follows guidelines while issuing licenses to contractors for mining aggregates, stones and sand from rivers and asserted that the municipal office has been acting responsibly. However, he agreed that management of the rivers and jungles has been done in fragments by local governments and this has made conservation efforts ineffective. “There is a lack of collaboration and coordination between local bodies for managing natural resources that are shared between them. Lack of communication between these local bodies sometimes even invites clashes between locals,” he stated. One of the related issues over which there has been discontent among the locals is the building of embankments along the banks of Balan River. Two years ago the Water Induced Disaster Control Office took initiatives to build embankment to control flooding. The decision was taken after the river changed its course and posed flood risk to the nearby villages. This decision to build embankments had given a huge relief to the people. However, the municipality scrapped the decision and even issued call for bids for mining aggregates and stones from the river. “Though the municipality has called for bids to excavate sand, stones and aggregates from the river bed now, these activities have been going on for a long time. And the municipality had kept quiet,” reported a local of Lahan, Ram Bharosh Mahato. “The local government has been allowing the contractors to excavate resources from the river for a long time now. The call of bids by the municipality is an attempt to provide legality to the contractor’s activities. It’s a staged show,” he added. Locals claim that collection of sand and aggregates has been going on for long time now and even the municipality has been receiving taxes from the contractors. “The municipality receives taxes from the contractors by issuing invoices. However, the transaction records put on the paper are not real. Municipal officials take bribes from the contractors and in return by issuing invoices give them legal basis to exploit local natural resources,” he accused while conceding that he did not have proof. “This is what is happening here no matter what the officials tell you,” he added. Investigation by Republica brought it to the fore that the contractors pay Rs 100 per a truck of sand to the municipality. Rate for a truck of gravel is Rs 200. After the payment is done to the municipality, the contractors are allowed to mine them from the river. “ That is just for the sake of formality, in reality the contractors have been taking many times more than they have paid for. If you don’t believe, just go there and record your self,” Mahato said.